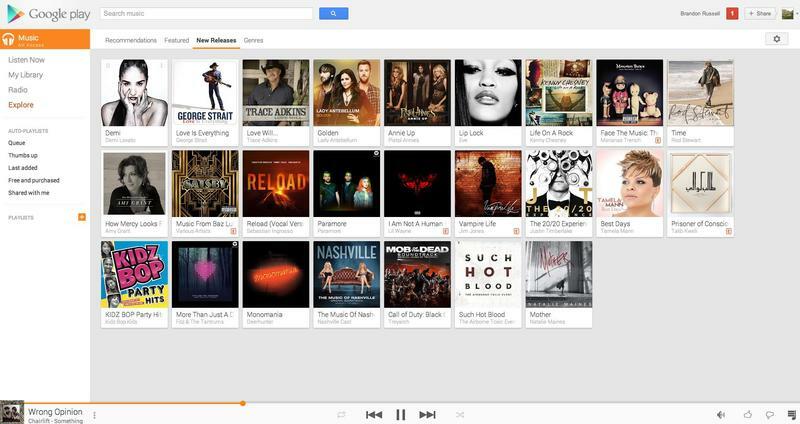 Google Play Music All Access Hands-On: Enough to Take on Spotify? 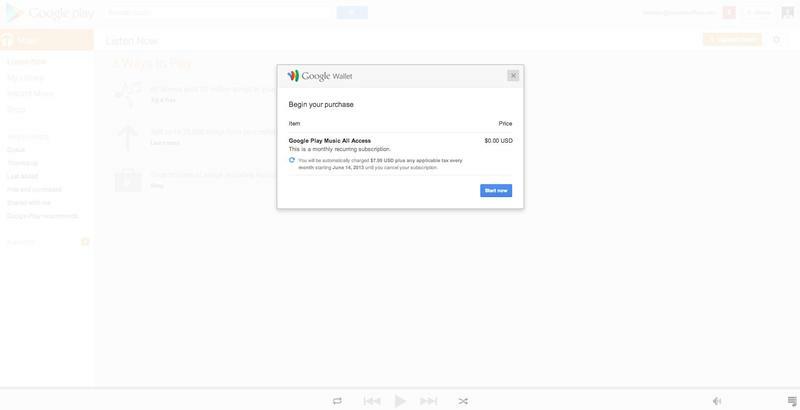 Before Apple and any other big name company jumps into the busy music streaming world, Google introduced its own service at I/O on Wednesday. 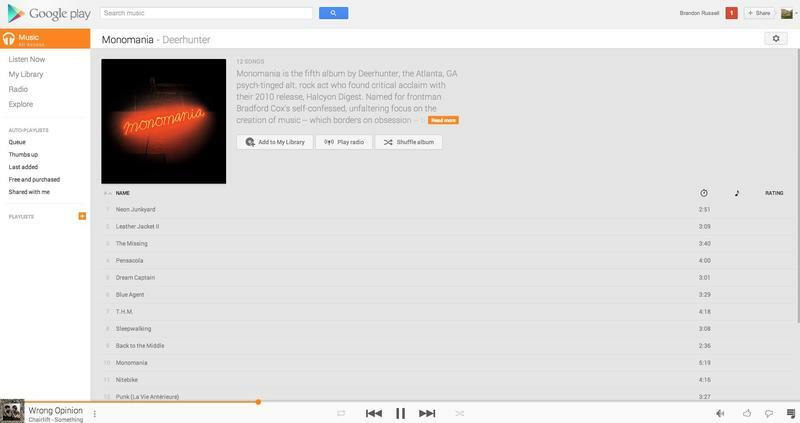 The platform, called Google Play Music All Access, is a Spotify clone that allows users to pick and choose precisely what music they want to listen to. Everything plugs in to the search giant’s already growing music catalog—and your own—with some typical streaming flourishes such as the ability to create radio stations, and a discovery engine that suggests music based on what you previously listened to. We signed up for a free trial—which will then go to a paid option in thirty days for $7.99, otherwise it’s $9.99 per month—and came away pleasantly surprised by how smooth and capable the experience was. For something so fresh off the factory line, everything worked to perfection and, in fact, navigating through the service was easy and fast, very intuitive. 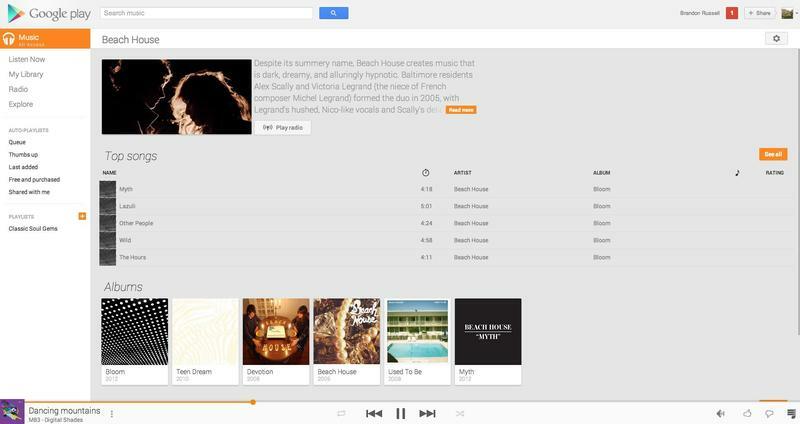 Google’s impressive minimal footprint is everywhere, pushing only the music forward, and getting to exactly what you want to listen to is simple. When you jump into the Listen Now portion of All Access, you’ll see a grid of recommendations—albums, playlists, songs—along with a search bar at the top. Clicking on an artist will bring you to that album’s page, where you’ll see options to add to your library, shuffle album or turn into a radio station. Playing a song will open up a music bar at the bottom of your browser, which stays persistent when you’re browsing and listening so you don’t break your stream, even if you hit back or forward in your browser. Additional options when you’re in an album page include the ability to add to your queue, share with friends (only through Google+, sadly) and even share that song’s particular YouTube video. Otherwise, pages are pretty sparse, and present tracklists, album art, and rating options in a big gray page broken down by faded lines. You won’t get lost, and in fact you’ll never arrive at a point only to realize you’re stuck. The search bar is present no matter where you are in the service—unless you expand the song’s album art to take up the browser window—so it’s easy to back out of where you are and into where you actually want to be. And no matter where you are, you’ll always see related artists, making it easy to discover new music. If you do find an artist you’ve never listened to, Google provides a nice little bio, top songs, and every album that’s available for you to listen to from that artist. If you’re listening to a song and click on the Radio option, you’ll be presented with a full list of songs that are upcoming. 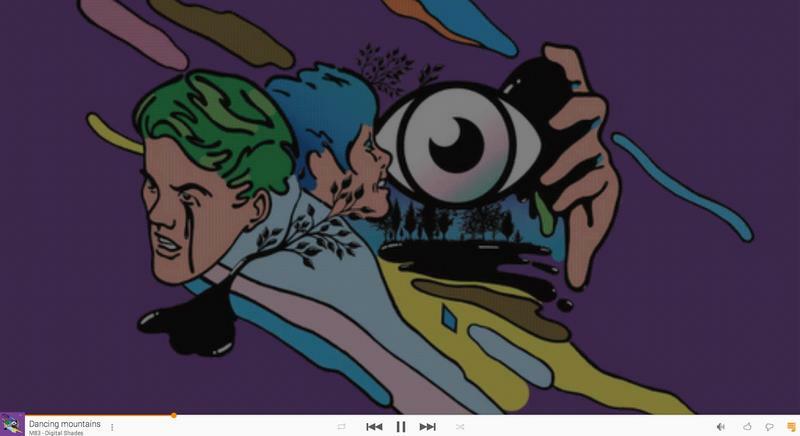 Again, everything is super slick and laid out very simply, with a little equalizer animation by the song that’s playing, and album art for songs in your queue. You can click on Google’s “…” icon, you can add to your library or playlist, share, or remove so you don’t even have to listen to the song. There are also the familiar thumbs up and thumbs down options so you can rate everything you hear. You can jump to any song in the queue, or even replay a song numerous times, giving you plenty of control over the experience. If you wind up thumbs upping a lot of music, those songs will show up in a playlist in a bar to the left, where you can also see Last Added, Free and purchased, and stuff you have queued up. When you just want to browse, there’s an Explore button on the left side split up with recommendations, featured (including featured playlists that you can subscribe to and even shuffle), new releases and genres, giving you an endless pit of music discovery. I didn’t get the chance to try the experience out on Android, so I can’t speak for how it all works in a mobile environment. But I really enjoyed using All Access on the desktop, and I’m really considering paying once the free trial ends next month. The UI is smooth and very intuitive, and there’s enough content to keep my ears happy while at work. Of course, this experience is based on very limited use, but I really like what I’ve seen and heard so far. As for going up against competing services such as Pandora and Spotify, it’s difficult to say whether this is more worth your money. It wouldn’t hurt to try the free trial, which lasts for 30 days, to see if this is something you could get behind. 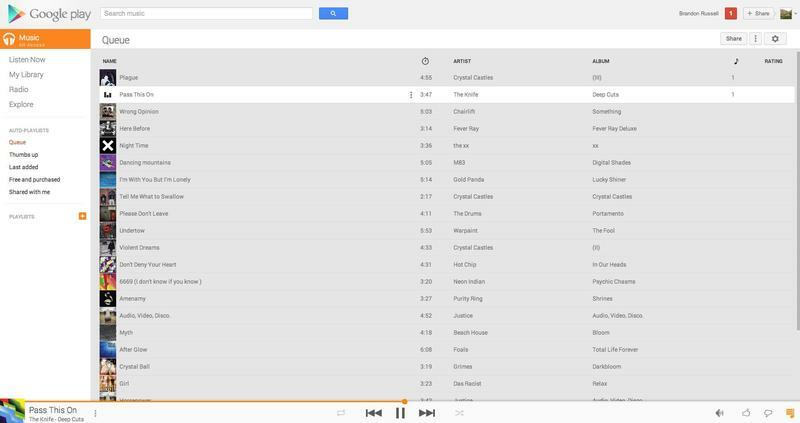 I already can’t stop listening, and applaud Google for concocting such a solid and intuitive service.